Steven Gerrard has admitted he left Kyle Lafferty out of the match day squad to face Livingston purely to get a reaction from the Northern Irish striker, whose stock at Ibrox has dramatically plummeted since his much-hyped signing from Hearts in the summer. The ex-Norwich man has barely played for Rangers since joining, and his manager dropped a subtle hint that a move out had been discussed but rejected and instead he and Rangers’ management want to see the 31-year old forward prove his worth instead. Of course, the reason he can’t move out, on loan at least, is he’s already played for Hearts and Rangers this season and FIFA rules forbid playing for a third club in one season for any player – which is the same reason the story about Borna Barisic to Besiktas was complete twaddle but we had to cover it anyway. As for Lafferty, clearly the idea of him leaving permanently had also been posited but we suspect the player has absolutely no desire to leave at all – and of course those FIFA rules apply whether it’s a loan or permanent in any case. 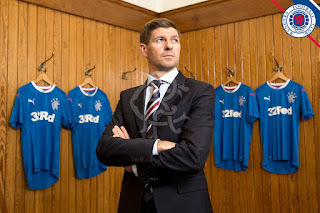 But regardless, Lafferty is up against it – and it may have dawned on Rangers’ management a touch too late that he wouldn’t be able to leave on any basis – and Gerrard is now challenging the attacker to start impressing him. He is being more than a touch clear that the ex-Sion striker isn’t impressing enough in training or on the pitch to merit selection, even if he does have the untouchable Alfredo Morelos as competition. We shall see this evening if Gerrard elects to give him a run out at Central Park. Well he got his chance and took it. Well he better pull his finger out and get back to his winning ways. We can't afford to be 'carrying' anyone. So far, he's nothing but a burden. Come to Rangers, top flop. Come on son, get stuck in and show us the old Lafferty. I also think Lafferty/Defoe up front, may be worth a try. Nothing to lose, by giving it a try. He Needs to Start Scoring otherwise we will have to think about Getting Him off the Wage Bill for Someone who can.